In contrast to the veneer of a homogenous state-approved Thai ethnicity, Thailand is home to a heterogeneous population. 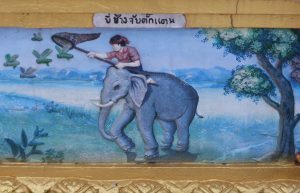 Only about one-third of Thailand’s inhabitants speak the national language as their mother tongue; multiple alternate ethnolinguistic groups comprise the remainder of the population, with the Lao in the northeast, often called Isan people, being the largest at 28 percent of the population. Ethnic divisions closely align with areas of political party strength; the Thai Rak Thai Party and its subsequent incarnations enjoy strong support from Isan people and Khammuang speakers in the north while the Democrat Party dominates among the Thai- and Paktay-speaking people of the central plains and the south. Despite this confluence of ethnicity and political party support, we see very little mobilization along ethnic cleavages. Why? I argue that ethnic mobilization remains minimal because of the large-scale public acceptance and embrace of the government-approved Thai identity. Even among the country’s most disadvantaged, as are Isan people, support is still strong for “Thai-ness.” Most inhabitants of Thailand espouse the mantra that to be Thai is superior to being labelled as an alternate ethnic group. I demonstrate this through the application of large-scale survey data as well as a set of interviews with self-identified Isan people. The findings suggest that the Thai state has successfully inculcated a sense of national identity among the Isan people and that ethnic mobilization is hindered by ardent nationalism.